Membership – Sign up for the Parrothead Club! We say the same thing every year about this time. We all had a busy summer despite the rain and postponement of the Annual Sand Bar/Island Party and as you can see on the What’s Up pages, there are lots of thing happening in September. The Parrot Heads have 2 major events plus the PHlocking but there are so many community events happening as well and they are all looking for our Parrot Head help. You see, we have earned such a good reputation with our Party with a Purpose motto that everyone wants us to come and help and make their event fun. Please check out the volunteer opportunities and pick out a few that suit your mood. For some of them we will have sign up sheets at the PHlocking or a Parrot Head contact email and for others, we ask that you contact the organization directly. Let’s show them how good we are at helping and don’t forget to mention that you are a Parrot Head, let’s keep the good publicity going. We had no July PHlocking as it fell on July 4th but I have to say, the August PHlocking was off the charts. Mike and Pat Haut were in charge of the EI Parrot Head Anniverary PHocking (12 years) and the games they came up with were doozies. While I do have a picture (decided not to share it for risk of total embarrassment) of the one game involving wooden rods, sand paper and 8 brave volunteers; if you want to know about the game itself, check in with Jan Hicks for a colorful description. The 50/50 raffle was won by Erin Nelson and $86 was earmarked for the Carteret County Humane Society Shelter. Our Club added $14 so the Shelter will receive a check for $100. Unfortunately, we had to cancel the Anniversary Weekend Sand Bar Party due to unrelenting rains (we can do it with a shower or two but this day was unreal with no let up) Check the Event page for the details of our rescheduled party on Sunday September 7th. It is almost Float time again, ( I know hard to think about a Christmas Float in August/September). The parade date is November 29th, the Saturday after Thanksgiving. We will be having a planning meeting to decide the theme for this year in early September and we will have a sign up sheet for planners and builders at the PHlocking. If you would like to be part of this very fun event ( a great way to get to know your fellow Parrot Heads) sign up or email me at stonesend@gmail.com so we can keep you posted. Both Kip Baker and Kelley Nelson have a few ideas but we always welcome additional creative ideas. We are working on securing a trailer and as usual, the build will be at our house unless someone else has some better (or covered) space in which to build the float. If you won’t be in town for the Parade, you can still be part of the fun build sessions (usually involving food and beverages). Emerald Isle Parrot Head Club Inc.
Get ready for this month’s PHlocking by digging out the best Irish/Green outfit you can find and make your way to the Emrerald Club as we have officially proclaimed this month St. Patty’s Month (and the trees, grass and bushes should be greening up also to acknowledge the favorite color of Emerald Isle) so lets start the month off right! There will be some Irish music, fun and games to help get you in the mood. Bonnie Forkey and company will be getting us all in the mood and has a few tricks up her green sleeve. Everybody is gearing up for our next big showing at our Parrot Head booth at the Emerald Isle St. Patrick’s Day Festival. We’ll have lots of bling and decorations, info on the Club and what we do, a Riff Raff Raffle with a variety of donated items from generous local merchants and Parrot Heads, and of course all the proceeds of this will be donated to charity. This year’s charity will be the Carteret County Domestic Violence Shelter . I ‘spect you’ll also see Party-On the Parrot running around, and you can get your picture taken in our giant pirate cut out. Stop on by and join in the fun at our booth and take in a great festival with something for everyone. The Town does an amazing job at putting this whole event together and it shouldn’t be missed. Our February PHriday PHlocking celebrated Mardi Gras with folks pouring into the Emerald Club in costume and bringing in all kinds of gumbos, beignets, and other tasty treats related to Mardi Gras (even a King Cake; Leanna scored the baby) to party in true New Orleans style. Our PHlocking Committee made sure there were plenty of beads and masks to go around, people came dressed to carry on, and pumped up the good times and laughter with teams of PHlockers doing their best to dress up one member in the rowdiest Mardi Gras outfit; thankfully, few pictures of this survived. After a spirited game, Lee Summer Williams and George Brumbelow were ceremoniously crowned mini-marshmallow catching queen and king. Our own Bobbie Raub DJ’d the event with an infusion of Zydeco music to keep everybody cranking with good tunes, and a 50/50 raffle was held with winner Carl Rauschenburg donating back his 50% of the take to the Salvation Army who was the chosen charity for the mini raffle. 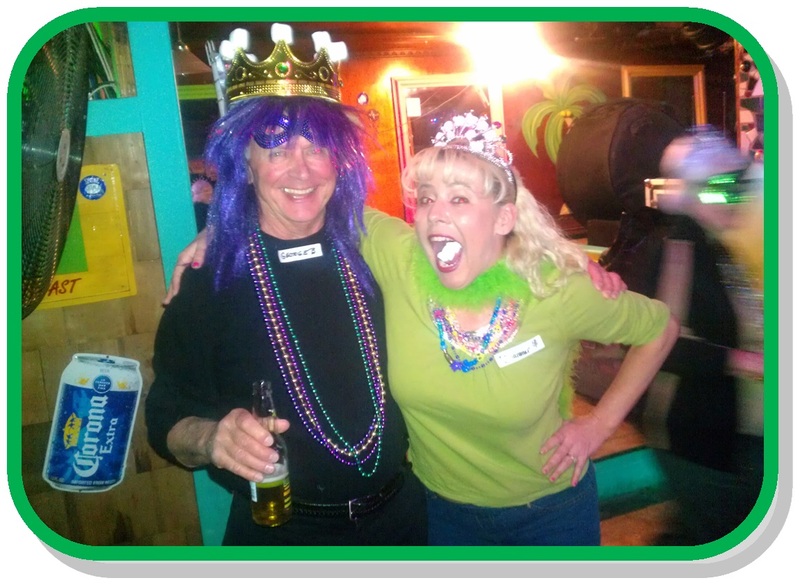 Parrot Heads… generous and fun loving as can be! Don’t forget to check out page 2 and print out all the dates for upcoming Parrot Head events. March 1st (Friday) First Friday PHlocking: 7:30 at the Emerald Club. We will have 4EverAll playing, some food and games. Bonnie Forkey and her crew have lined up some fun, all geared around St. Patty’s Day (or is it St. Patty’s Month) so come prepared and dress in your best green and Irish outfit. The Green is not only for St. Patty’s Day but to welcome Spring to Emerald Isle. 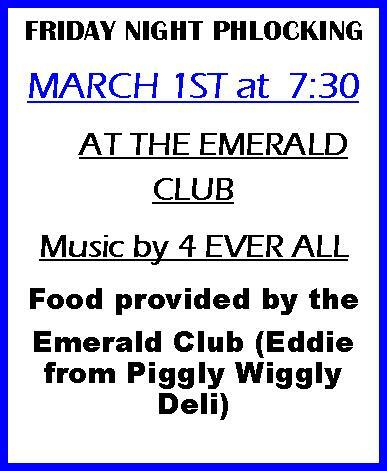 Food by Eddie of Piggly Wiggly. March 2nd (Saturday) Hoop Pole Creek Clean-Up for the NC Coastal Federation , 10-12 in Atlantic Beach – We have a group of about 15 of us going but there is always room for more. Sign up at the PHlocking or send me an email at stonesend@gmail.com. We hope to do a little car pooling and go out to lunch after. March 7 th – (Thurs) 7-9 PM Oyster Roast, Hannah’s Haus, Beaufort .Support the N.C. Coastal Federation with local oysters and great beer, both provided at Hannah’s Haus in Beaufort. There is no cost for this event, but donations for beer and oysters will go directly to the Federation. A special Federation membership will be offered during the event, so bring your friends. Volunteers are needed at the Federation’s membership table and at the oyster tables. Contact Sarah Phillips at sarahp@nccoast.org to help. March 16th (Saturday) – Emerald Isle St. Patty’s Festival – We usually do what we call a Riff Raff Raffle and folks purchase tickets that they then put in a basket in front of whatever they want to win. We ask for donations from our Parrot Head members and local businesses. Money raised goes to a pre selected local charity. We now have all the shifts filled but we are still looking for items. Please let me know if you think you can get a donation from a favorite vendor. We still need about 8 more items. Hope to see you at our booth in front of Ellies Gift shop. Proceeds from the raffle will go to the Carteret County Domestic Violence Program . April 11th (Thursday) 6 PM New Member Social at Senor Dicks in Cedar Point – Old and new get to mingle and chat and learn more about the Parrot Head Club. The Club will be providing Pizza and snacks, there is a full bar, plenty of space to stand and sit. At 8 PM Hector will be playing some tunes for those who stay. Often times it is hard to chat at a PHlocking, this will give you a chance to get to know folks better. RSVP (old and new ) to Sue Stone at stonesend@gmail.com or sign up at the PHlocking. April 13th (Saturday) Adopt a Highway Pick up –Meet at 11 am at the Emerald Club. Sign up at the PHlocking or contact Jean Jensen at belguimboy@aol.com . There should be a lot of visability with the bridge construction so be sure to wear something suitable for Parrot Heads, hats, shirts etc. May 18th (Saturday) – Save the Date for the Beach Bike Poker Run. This is the biggest event of the year and we need all the help we can get so make sure you mark your calendar and stay tuned for details. If you can’t participate in the actual ride, please remember we need card sharks stationed at each of our stops. HELP WANTED: We need 3-4 people willing to work for 1 hour at PHlockings. If we get 3 people, you would only work 1 hour every 3 months! We also need someone to keep track of inventory and reorder when necessary. John Dyer has just ordered new shirts and they are in but he is taking on a new role with the technology part of our club and we need a new Point Person for Shirts. Please consider helping us out. We have almost 300 members, we should be able to get some help for this. CLUB T-SHIRTS: March PHlocking from 7:30 – 8:30 only….so come and buy early. There is an assortment of colors, first come, first serve! Available to Club members only! For the March PHlocking, you need to find Ken Stone to pick up your free birthday “gift” to help you celebrate. 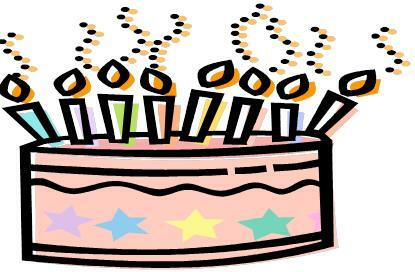 In the meantime, please wish the following March Birthday birds a happy birthday. Coupon may only be used at the birthday month PHlocking. Please make sure you take the time to look for, and meet our newest members. We have a “special designation” ( a colorful flowered lei) for new Parrot Heads to wear at their first PHlocking so it will be easier to spot them for introductions. If you are new, find Sue Stone or Kathy Ruge and get your welcome “lei”. Of course, the best way for new members to become part of the Club is to volunteer for activities. Be sure to look for the Volunteer Sign up Book at the PHlocking. Membership dues are DUE! Please make it easy on those of us who try to keep track of this and pay early. Again, this year it will be $10 per person per year. We do this on a calendar year and do not prorate. Those who joined late last year will be credited as paid for 2013. If you can’t make a PHlocking, please send a check to Emerald Isle Parrot Head Club, 9701 Ashley Place, Emerald Isle, NC 28594 for the dues so you can stay on the mailing list. 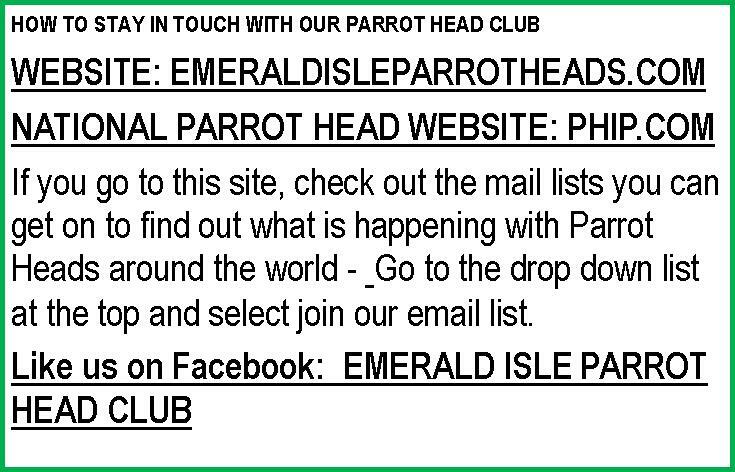 If you go to this site, check out the mail lists you can get on to find out what is happening with Parrot Heads around the world – Go to the drop down list at the top and select join our email list.